Hehe, thanks, love you guys too. And from next week ( after New Year's day) on, I don't think I have much free time due to second term, so my next updates will slow down. It's funny to see Nanoha cheering for Fate after that, but at least for me it wasn't easy to understand due to the panel distribution. Ah, sorry, I forgot to tell you. Except for the first one which is followed the arrows, all of my comics is read from left to right, from top to bottom. By the way, when will the third Megapack be release? Not anytime soon I think. We'll wait to have Das Resultant finished to make it, so it will take us a while. Probably a pair of month from now at least. But, for Nanoha, it shows her how much Fate love her, she don't want anybody to try to seduce her beloved White Devil. Did you see that straw man in the seventh panel? Fate didn't hit Yuuno directly, but through that straw man. Maybe Hayate lent her that. Yeah, I see the voodoo doll, I wish I have one to hit some people I don't like. One of the cutest images I've ever seen. Oh, first time I see one of your drawing I think, very nice! Both art and theme suit my tastes perfectly ;3. I made this pic in my notebook out of boring during my classes, I intend to have Fate in there but I don't have enough space. So, what do you think? Should I redraw it with much more quality? 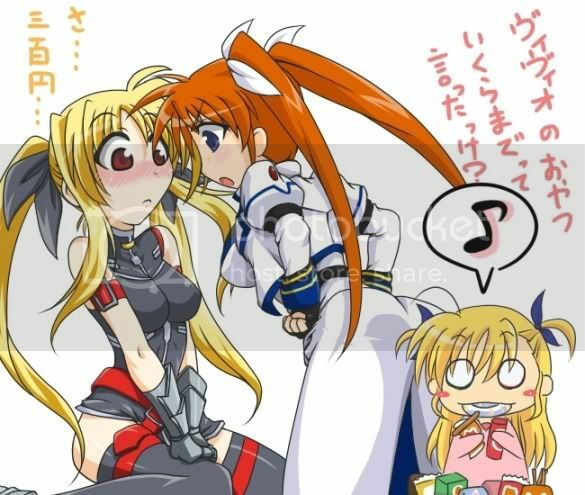 Nanoha: *mumbles to herself* Not cute! *raises her voice* Honey, bring more clothes!! Fate: Yes, dear, I'm coming~~. Read from left to right, okay? And with twice the mothers, twice the problem! It's a funny short comic, thanks Titi ! And I forgot : Happy New Year, Everyone ! Nanoha : How much did I told you to spent for Vivio's snacks? Thanks a lot for translating this Nina! Happy New Year everyone. Maybe I'm a bit late? I just woke up. Haha, over 9000, no wonder Vivio lost to Fate. Anyway, do you want me to draw a pic with the family going picnic?